Ryan Bouricius '17, used a 3D printer to create a prosthetic hand. Photo by Giovanni Santacroce. For some amputees, prosthetic hands can be a life-changer but also a financial challenge—especially if a child needs multiple hands to be made as they grow. Ryan Bouricius ’17 is trying to make those financial concerns a thing of the past. 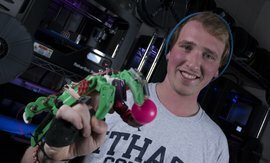 Using the Ithaca College 3-D printing lab, the physics major designed and built a functional prosthetic hand that only costs about $15. A nonprofit organization, eNABLE, will match the prosthetics with an amputee in need.